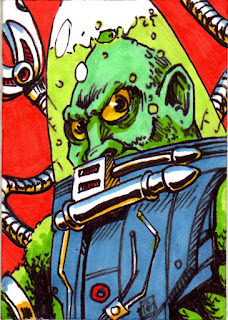 Taylor's Sweet Little Art and Nerd Site: Sketch Card of the Day- SlushHead! Sketch Card of the Day- SlushHead! Today's deviation is Slushhead! Oh Slushhead, or if you know him by Kalamarr, Oh Kalamarr. This guy is basically a mass of fish man with a fish bowl on his head. And it seems that I am making fun of this guy, but one of my child hood heroes was a motor bike riding fish known as Fearless Fish from the Sweet Pickles book "Fish and Chips" and he wore a water filled bowl on his head. And I can't just stop there. There is even more attractiveness to the Aquarium Helmet wearing heroes from my past! What about Ed Harris's character in the Abyss? Yep, I wanted that Deep Diving suit due to the fact that he had a helmet filled with liquid. I know the last is a far cry to get prove a point, but... Anyways! So Slushhead was one of Flogg's, not Skeletor's, lackey space mutants. He had two techno arms that would flail claws and clamps around and he had a mean fishy disposition. Although the New Adventures of He-Man cartoon treat him as though he was lacking in brain power, I always viewed him as a pretty quick and efficient predator or assassin. Slushhead will be available in the Masters of the Universe Classics line this month. Sad thing is, I can only get one figure from the site, and that will be Stinkor. Maybe I can pull funds together to get this really cool guy. We'll see...You can also see this sketch card here. Now, I'm going to have a bunch of these sketch cards available at the Dallas Comic Con. I'll be selling them for $10. I am also opening commissions of sketch cards. They will also be $10 + shipping and handling which will be $6 in the continental United States of America. I'll have to get a quote for any territories outside of that. I will also open up my colored page line drawings for commissions. Same price as the sketch cards, but I'll have to check on the shipping (due to the difference in size). If you want to see what I mean by colored sheet drawing, go here. If you want a sketch card, send me an e-mail to taylorlymbery@gmail.com. Name your character and we will go from there. The Convention will be May 19th-20th. It will be at the Irving Convention Center that is located at 500 W Las Colinas Blvd. , Irving, TX. Tickets for Saturday will be $25.00 for 11:00am to 7:00pm, and tickets for Sunday will be $20.00 for 11:00am to 4:00pm. If you happen to go to the Convention, stop by and say hi to Rob and I. Sketch Card of the Day- Rokkon! Sketch Card of the Day- Clamp Champ! Sketch Card of the Day- Two Bad! Sketch Card of the Day- Vikor! Sketch Card of the Day- Optikk! Sketch Card of the Day- Hydron! Sketch Card of the Day- Captain Glenn! Sketch Card of the Day- Icarus! Sketch Card of the Day- Stinkor! Sketch Card of the Day- Man-E-Faces! Sketch Card of the Day- Rattlor! DIY Vinyl Toy Custom of the Month- Spikor! Sketch Card of the Day- Sy-Klone!